The following conditions of sales govern the online sale and recharging of transport documents of the RMSL of Formiguères. Contractual information is presented in French. In accordance with article L121-20-4 of the French Consumer Code : the sale of tickets is not subject to the application of the right of withdrawal provided for in articles L121-20 onwards of the French Consumer Code on distance selling. In this way, consumers have no right of withdrawal for any order carried out at the RMSL of FORMIGUÈRES . All prices stated when the order is logged are in « Euros ». Services will be invoiced in all taxes. The VAT applicable shall be the VAT of Transports. In addition to his tickets, the purchaser can buy an individual insurance covering emergency runways (only for the services that allow it). It is the responsibility of the Customer to decide for or against this insurance. Orders will exclusively be made online : www.formigueres.fr. The purchaser must be at lest 18 years of age and be legally capable of contracting and using the site in accordance with the present General Conditions of Sale. Supporting documents : These documents must be supplied before the granting of the package. They focus essentially on the age of the skier, its membership in a group that would offer him particular advantages such as : Student, Senior from 65 to 69 and children under 5 years old), his photo for the tickets “6 days” or “season”. These documents are available for download on the web site www.formigueres.fr, or be sent directly to the e-mail adress station@formigueres.fr accompagnied by the purchase order number or be sent to the following adress : RMSL – SERVICE BILLETTERIE – 66210 FORMIGUERES. The purchaser guarantees the accuracy and the truthfulness of the personal details provided. In case of misuse, the RMSL of FORMIGUÈRES can prohibit ski area access until the purchaser regularized his position. The Customer will be asked to pay the additional cost entailed. Place of withdrawal : The tickets will be exclusively recovered at : STATION DE SKI DE FORMIGUERES – SERVICE BILLETTERIE – 66210 FORMIGUERES in exchange for the printed purchase order when the purchase has been achieved and an identity document. In the event of non withdrawal by the purchaser, no refunds and postponement will be available. Promotion Period : They are decided by the administration board of the RMSL of Formiguères and remain valid for the current season. The fees are clearly indicated and shall apply until the last day of the “Midnight” promotion. Beyond that, any order will apply the “full” tariff. The RMSL of FORMIGUÈRES puts some smart cards at the disposal of its customers which can be rechargeable via internet. The cards are the property of the FORMIGUÈRES RMSL and be used exclusively to purchase transport documents of the FORMIGUÈRES ski resort. The orders can only be registered on the web site if the customer establishes an identity by entering the card number and completing the online form. Then, the process of ordering will take place by a serie of data entry on successive screen pages. in accordance with the requirements of the section 1369-5 of the French Civil Code, the customer has the opportunity to verify the details of his order and its total price and to correct any errors before confirming the order and thereby expressing his acceptance. The provider will confirm its order by email containing a summary of all the ordered products whom the customer will have confirmed the order within 24 hours. By subscribing, the customer declares to accept the present particular sales conditions as well as the General Conditions of Sales and Use of transport documents on ski lifts as displayed at the checkouts. The customer is asked to keep a copy of its order confirmation and another one of the present particular conditions in paper or electronic format. Supporting documents : These documents must be supplied before the granting of the package and be downloaded from the order transferred by email or mail. The purchaser guarantees the accuracy and the truthfulness of the personal details provided. In case of misuse, the RMSL of FORMIGUÈRES can prohibit ski area access until the purchaser regularized his position. The Customer will be asked to pay the additional cost entailed. The smart card is NOT considered as a transport document.This is the “paper copy” that permits to obtain the purchased transport documents. The packages will be issued only on presentation of the card either at the automaton or at the checkouts of the station. Conditions for use of the card : The card is non-exchangeable and non-refundable. The customer must have the card upon arrival at the ski resort of FORMIGUÈRES. The prices are published on the web site : www.formigueres.fr. These prices are subject to change depending on weather conditions or in the event of an interruption in the ski lift service. In the case of reloading, the customer is responsible for checking the price charged before going to the automaton. In any case, the rate charged during the operation of recharging can not be modified. In the event of interruption of ski lifts, our General Conditions of Sale and Use of the station are applicable. In no case will the owner FORMIGUÈRES RMSL reimburse any purchase of ski passes done by the customer resulting from the card being forgotten, lost or stolen. Lost or stolen Card : In the event of loss or theft of the card, the customer will have a maximum of 72h to inform the “customer service” by telephone or the web site. The card will become invalid and no longer be available for use. A e-mail will be sent to the customer to inform him that the card will be blocked. For any new issue of card, the current rate will be applied. If the subscriber recovers the card declared lost or stolen, he must send it by registered mail to the RMSL of FORMIGUÈRES. 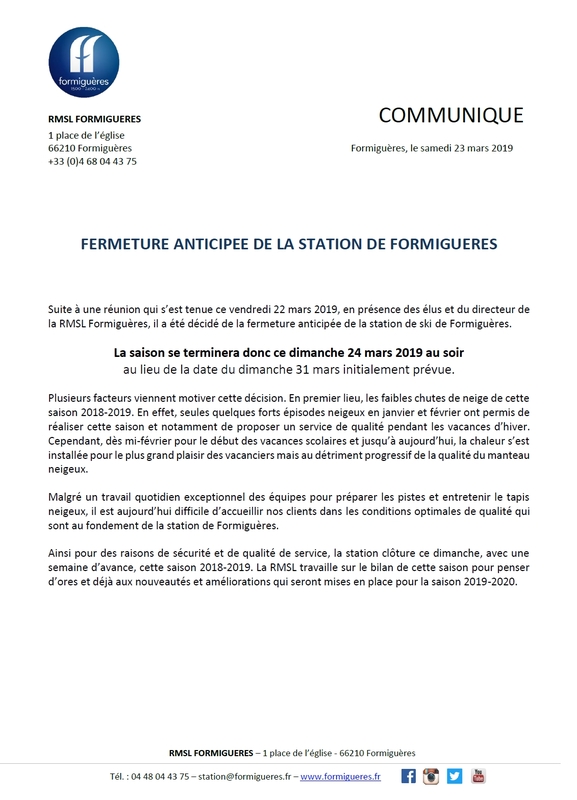 Faulty Card : In case of failure or technical failure of a card, the RMSL of FORMIGUÈRES will proceed as soon as possible and with all costs paid by them to the replacement of the faulty card against and counting from when the faulty card is returned. However, if after verification, the card is faulty due to the customer, the RMSL will invoice him the replacement cost of the card. Validity of the card : The card is considered as valid when purchased at the point of sale dedicated to this activity and after updating of the « customer master record ». The card can not be paid with assets. It is authorized for use without a time limit. By itself, the impossibility to read the microchips leads it to its withdrawal. It is recommended to renew the card every three years. The recharging is usable during the entire current season and until 31 December of the next season. Method of order and payment : It is specified that the credit card payment is secured by SPPLUS that guarantees the confidentiality of the payments. The payment is made with virtual EPT ( Electronic Payment Terminal) and includes an immediate payment. At no point the RMSL of FOMIGUÈRES is not aware of the number that the customer must provide. The RMSL of FORMIGUÈRES is only notified by the banking establishment Caisse d’Epargne Languedoc-Roussillon that a transfer corresponding to the amount of this order has been done on its bank account. The orders will be those that were subject to an agreement from the banking organization. The refusal of the authorization to debit the customer’s bank account by his bank entails the cancelation of the order process and the recharging. The customer will receive a notification from his bank. Once that the order if the package is confirmed by the customer, the package ordered may not be reimbursed, returned or exchanged. Similarly, no change will be allowed to the order. Payment in 2 or 3 installments : When this possibility is available to the customer, the full payment will have to be paid on the 31 December of the current year. The RMSL suggests to assist you in the purchasing of your package online. So, by calling at +33 4 68 04 43 75, you can now ask for a phone support. Our team will help you in your order preparation steps, sending photos and receipts. Upon settlement, en email will be sent to you (at the address you have indicated). At the opening of this email, you will find a link that connects you to the secured page of our banking partner Banque Populaire du Sud. You could then complete your payment in peace. Our banking partner will report us the payment and our “Ticketing” service will proceed with the issuance of our order. At no time, the RMSL and the entire staff will not have access to your secure data. It will be not necessary to provide to our hostesses the details of our credit card. Liabilities and warranties : The RMSL of FORMIGUÈRES will be held liable for an obligation of means concerning all the access steps to the online sale. The responsibility of the RMSL of FOMIGUÈRES is not engaged for any inconveniences or damages due to using Internet network such as a service interruption, outside intrusion or the presence of IT virus or more generally, for any other event deemed to fall under force majeure, as recognized by law. The customer declares having been informed of the characteristics and limits of the Internet, in particular its technical performances, the response time for consulting, examining or transferring data and the risks related to the security communication. Methods of proof : The online provision of credit cards numbers and more generally, the final confirmation of the order by the customer is considered as a proof of the entire transaction procedure in accordance with the provisions of the law 2000-230 of 13 march 2000 as well as the requirement of the payment. This confirmation is equivalent to a signature and express acceptance of all the operations done on our online sale module. The customer must retain the “order” email, the only document that is taken in the event of litigation on the terms and conditions of the order, particularly during checks on the ski lifts. The information related to the validity of the transport document and written on the card do not have any contractual value. Billing : This provision exclusively concerns the authorized depositaries that are members of the system “ My Formicard ”. The cards placed on deposit will be recharged by the provider for its customers on the web site with an individual secure access. The amount of the “shopping basket” will be directly transferred toward the customer account of the partner and paid each end of month.The payment shall be invoiced upon receipt. The information collected by the RMSL of FORMIGUERES is obligatory and essential to the delivery of the tickets. This information is intended for the use of the RMSL of FORMIGUERES for administrative management and commercial purposes as well as for the Expense Administrator as justification of the reductions or exemptions from payment granted in accordance with the rules of public accounting. In accordance with the law No 78-17 of January 6th, 1978 relating to data processing, the files and freedoms, the customer has a right of access, correction and suppression of its personal data. This right is exercised by contacting the Customer Service. All the banking data requested from the customer during the making orders are protected by an encryption process certified 3D SECURE. According to the article 32 of the data-processing law and freedoms, the RMSL of FORMIGUERES informs the customer regarding all the uses made of its data and in particular the possibility to send commercial offers. The filing of the orders is carried out by the Customer Service of the RMSL of FORMIGUERES in accordance with the L134-2 Article of the French Consumer Code. Under these conditions, the customer can thus reach his order filed and must request this by writing to the above Sales Department.